One thing that every Lexus or Toyota vehicle ever made has in common is the standard service interval. Every 5000 miles, these vehicles need some type of service. At its core, the 5K interval service starts with the factory recommended inspection that is designed for that model. Other service items might include oil, filters, tire rotation, or some other fluid exchange. In the early days of Lexus during the 90’s and even extending into the early to mid-2000’s, minor service intervals were simple. Basically, everything centered around the oil change. Back then all models got an oil chang every 5000 miles. In fact, we became so focused on changing oil every 5000 miles that we began to forget about other important stuff like inspecting the vehicle for other needed maintenance or repairs. The other thing people tend to focus on are the big expensive maintenance items, like timing belt replacement. Well guess what? Most modern vehicles, including Lexus and Toyota, don’t require oil changes every 5000 miles and timing belts are a thing of the past on vehicles made after the 2009 model year. So, what do we do now? Luckily, Lexus and Toyota vehicles have at least one maintenance reminder light to notify you when it’s time for service. When illuminated, this is the easiest way to plan for your vehicle’s next service visit. Regular visits every 5000 miles will lessen the likelihood of any real trouble from your vehicle. There is nothing more important for the longevity of the vehicle than to have it inspected at service time. Without a qualified and experienced set of eyes looking over your vehicle at service time, critical service items on your vehicle may be over looked at best or completely neglected at worst. 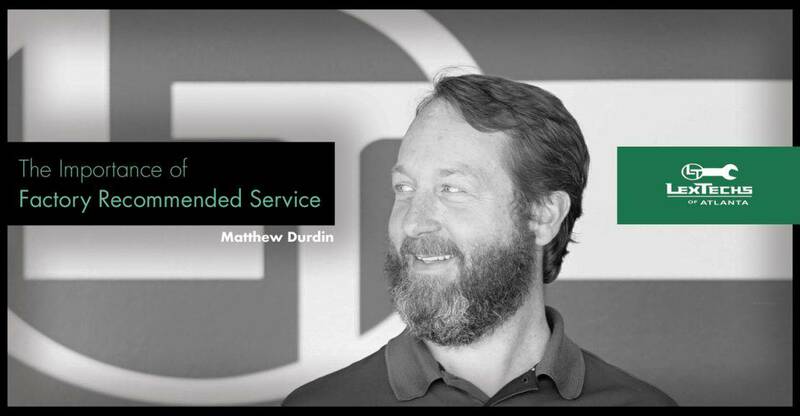 My name is Matthew Durdin, Service Manager with LexTechs of Atlanta. I want every Lexus or Toyota owner that leaves our shop to feel they have just made a great investment for the future of their automobile. Stop by anytime and let us explain in detail what we recommend for your car as well as address any concerns or questions.